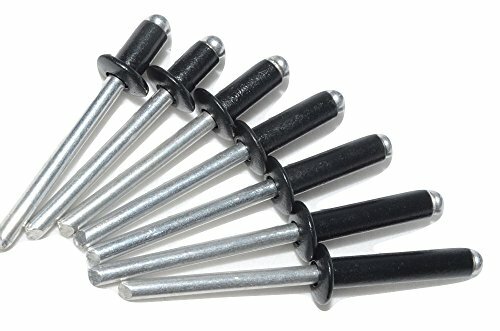 100 BLACK Aluminum POP Rivets 1/8" Dia x 1/2" Max GRIP 4-8 *** A WORD ABOUT GRIP LENGTH *** ALL rivets are sized by DIAMETER x MAX GRIP. If the rivet title says 1/8" x 1/2" OR 1/8" x 1/2" GRIP (or MAX GRIP) then the rivet body has a diameter of 1/8", and the GRIP of the rivet is for material thickness UP TO 1/2" The ACTUAL RIVET LENGTH WILL BE LONGER THAN THE STATED MAX GRIP TO ALLOW FOR "BLIND SIDE" DEFORMATION TO SET THE RIVET. AGAIN, rivets will ALWAYS be longer than the GRIP stated.